Zimmern: Many people claim to be Andrew’s number one fan, but you’re the only one who has permanently inked AZ on your body (as far as we know anyhow). Why? Bacon tattoos? We understand. A tattoo of a knife? Go for it. 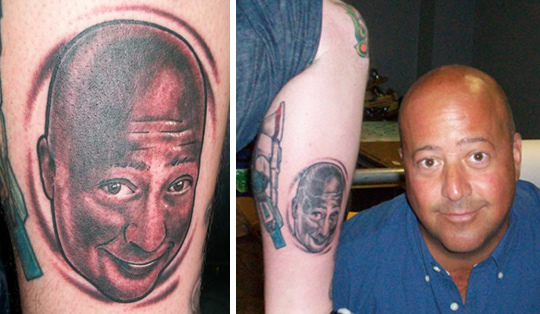 But a tattoo of the face of a cable television host who specializes in eating insects and fermented testicles? Baffling. OK, we'll bite: If any reader goes ahead and gets an Eat me daily tattoo, we'd totally run the pictures.